Although the use of drones to capture content for film and television productions may still seem new to some, Helifilm.com began using drones for photography way back in 2008. Today, we're the premier supplier of aerial footage in Scandinavia, offering services to national and international film teams and providing access to our extensive image bank of Scandinavian content. We provide material for the region's premier broadcasts, such as Nobel Prize festivities and royal events. We also provide Scandinavian images for feature films and commercials around the world. The drone production market is young and full of companies looking to get in on the action. In this environment, our focus on the quality of our final product allows us to stand out from the crowd. 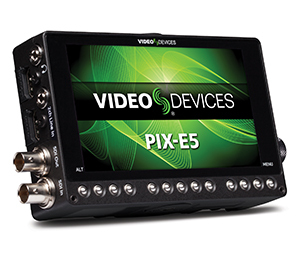 Quality is the central reason we began to use Video Devices' PIX-E5 recording monitor. The PIX-E5 is slightly smaller and lighter than the main competitor's offering, and this has proven to be helpful as our drone setup has evolved. We have tried two basic mounting options for drones. One has the entire kit (camera, video transmitter, PIX-E5) on the gimbal. The second design has only the camera on the gimbal. Both setups have their pros and cons, but we have decided on the latter approach despite the camera's cable feed slightly limiting its rotation. The reason we wanted a recorder on the drone in the first place was to improve quality. The Apple® ProRes 422 HQ capture that we get from the PIX-E5 is superior to the internal codecs on the cameras we use. This is important as our clips are often used in high-end productions where the availability of quality files for colorists and editors is crucial. The value of picture quality cannot be understated, and the PIX-E5 has proved invaluable on this score. The 2015 Nobel Prize festivities provide an interesting example of how the PIX-E5 has made our productions better. The Nobel Prize festivities are held in Stockholm on a midwinter evening. At this time of year in Sweden, the sun sets before 3 p.m. This required a low light camera with full frame optics that did not weigh much. The Sony a7S is exactly that camera, but the internal codec did not deliver the quality we needed. However, when used together with the PIX-E5 we were able to achieve a 4K recording system with a great codec€”a royal deluxe system for drones! We received great reviews from a very happy customer; the footage was outstanding. Ruggedness also matters in any field production, but particularly when the equipment will be subject to the vagaries of a flight out in the elements. This includes the inherent need for gentle take-offs and landings in any shoot. The PIX-E5 is very solid to me, it feels like an old Volvo 240 in terms of solidness and general toughness. This surely has helped us trust the PIX-E5 in situations where we only have one chance to capture an event. What do we like about the PIX-E5 in terms of its actual operation? First, it's very easy and not expensive to get material from the drone to a computer using its SpeedDrive removable media. At first glance, the SpeedDrive looks like a standard USB 3.0 thumb drive, yet the SpeedDrive's chassis can house an mSATA drive, which is capable of storage up to 1 TB. When connected to the rear of the PIX-E, the SpeedDrive's USB 3.0 interface automatically switches to a SATA interface, which is well-suited to record continuous, high-data-rate 4K video. The added advantage of the SpeedDrive is that no special card reader or docking station is needed; I can simply unplug it from the back of the PIX-E5 and plug it into any USB computer port to quickly and easily transfer data. Also, the monitor is very good, and is quite bright. We use the PIX-E5 as a monitor or a recorder/monitor on handheld gimbals, and for setting the focus on the drone cameras. For focusing we really appreciate the TapZoom feature. In general, our team has found it easy to operate with a great user interface; knobs and buttons are well-placed, and the touchscreen is of superior quality. Operation is intuitive, and the software is really well thought out. Our experience with the PIX-E5 tells us that Video Devices' quality ambitions match our requirements. We have used a few other recording monitors over the years, but these products cannot match the PIX-E5 in terms of size, weight, build quality, usability, and file transfer.